"There is a potential link but of course we need to be certain," a World Food Programme spokesman told the BBC. "We won't know until the government and WFP's laboratory tests locate where people are getting sick from," he said. The people taken in for treatment complained of vomiting, fever and other symptoms consistent with food poisoning, the BBC's Catherine Byaruhanga says. The WFP said that some people also had symptoms of "mental confusion". 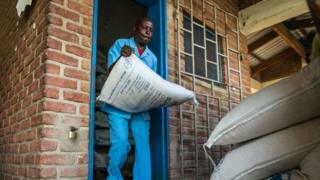 Super cereal is usually given to pregnant or nursing women at risk of malnutrition, but has been included in general rations across the country for malnourished Ugandans and refugees, WFP spokesman Peter Smerdon told the BBC's Focus on Africa programme. Uganda hosts some 1.1 million refugees - more than any other African nation. Many are women and children who have fled across the border from South Sudan. Previous conflicts there, along with drought and extreme poverty have left some communities reliant on food aid, says the BBC's Catherine Byaruhanga in the capital, Kampala.